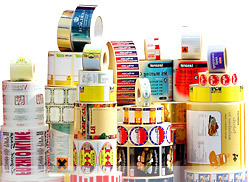 We produce self adhesive labels and tags in rolls made of a wide range of high quality materials. All labels are available in any dimensions and wounds to meet the customer’s needs. for most most printing and labelling devices, for every type of direct thermal and thermal transfer printers (e.g. Datamax, Zebra, Intermec, Tec, Eltron and others), and for scales: Medesa, Bizerba, Toledo, Metler, Berkel, etc. All the labels are available in varoius combinations of materials and adhesives corresponding with the customer's individual needs. We offer labels for direct thermal and thermal transfer printing, pre-printed labels and multi color labels with high quality flexo printing and UV coating (manufacturing on GALLUS ARSOMA). We produce die-cut and continuous labels, perforated or continuous tags / tickets. We also offer a variety of labels for special applications like identification plates, labels with good resistance to weather conditions, removable labels, also moisture and low temperature resistant labels.